Here is blog consisting of a few snippets taken from Chapter 1. It opens with a scene that took place when I had already been in China for half a year. March 21, 1976, the Horn of Plenty (Fengzeyuan) Restaurant, Beijing, China. A peculiar party of people is seated around a table, eating and chatting. The dinner must have been going on for a while, as the table is covered with a variety of dishes; beef, vegetables, a steamed fish, crispy chicken, and other delicacies. In China, courses are not served one after another, but often simultaneously, and dishes stay on the table until they are empty. The spirits are up, literally, as the food is washed down with Moutai, the Chinese distilled liquor that had gained global fame by President Nixon’s seminal visit to China only a few years earlier. With its more than 50% alcohol and esters and other molecules you would rather not know about, its intense odour has filled the air of the small separate dining room immediately after opening the bottle. You could easily associate this scene with Leonardo da Vinci’s Last Supper. If the master would have been present to observe it, he could have eternalized the scene on canvas, maybe as a study for his seminal painting. Both scenes involve a group of people who are at first sight connected by a common interest, but when you look and listen closer to the body language and the intonation of the conversation, you will pick up cues indicating that they are highly divided under the merry surface. That day was my 20th birthday. I was a Dutch student spending that academic year in China. The diners, besides me, were the other Dutch student, Chris, two Icelandic students, Torge and Reinar, a Finnish student Kalli, the Second Secretary of the Dutch Embassy, Ronald, and his wife Sarah. As none of us had brought a camera, there is no picture to show you here. But allow me to act as your eyes and ears to interpret the scene. It is by no standards your typical crowd of close friends. Beijing in 1976 was not the Beijing that hosted the Olympics, or the city with the surrealistic China Central Television Building, designed by a fellow Dutchman, by the way. Neither was it the China that is now pulling multinationals like McDonalds, KFC, and Starbucks through the global financial crisis. It was the China of the Cultural Revolution, of people’s communes, the country where our Chinese contemporaries were sent to the countryside to learn about real life from the peasants. What was I doing there? Especially at such a pivotal moment in my life? Many people seem to believe that your 20th birthday is a major milestone in a person’s life. Peter, Sue and Marc represented Switzerland at the 1971 Eurovision Song Festival singing ‘Laissez nous les illusions de nos vingt ans’, ‘Leave us the illusions of our 20 years’. I had not turned 20 yet then, but for some reason that refrain has gotten stuck in my mind. It is probably the only Eurovision song that I can freely recall at any time, so it must have struck a sensitive nerve. So what can we learn from this small selection in terms of things that you may not know about life in China in the 1970s? Well, what about the Horn of Plenty, for starters? That is not a very proletarian name. 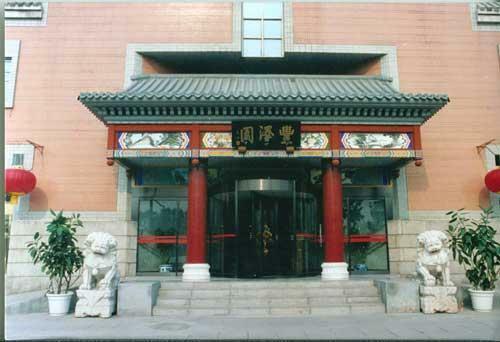 In fact, it was one of the so called ‘old numbers’ (lao zihao) of Beijing, restaurants with a long history. During the most violent years of the Cultural Revolution, such restaurants attempted to go proletarian, e.g. by serving plain dishes people would cook at home and offering them for very low prices. However, no one appreciated that, in particular the workers who before could hardly afford to eat in restaurants like the Fengzeyuan. What they really wanted was high end dishes for low end prices. Bad luck, that was not possible. Even during the most proletarian of all revolutions. Even revolutionaries needed to take the cash flow into account. Capitalism always wins. The spirits that we took to liven up the dinner, Moutai, was far from proletarian either. You had to pay a few months salary to buy a bottle of the stuff and even if you had that money to burn, you would not always have access to places where it was for sale. In other words, we were part of the happy few and enjoyed that without being bothered too much about our privileged position. A few of the foreign students did, but they were not part of our inner circle. We were young then. Most of us were in our early twenties. We were students enjoying the relative carelessness of European student life. Still, if there was one thing we had in common, it was sufficient determination to give it up for a while to spend at least a year in what was then regarded by most people as a secluded empire. This opening scene of the book not only reflects that even in the most revolutionary era of modern China there were luxury restaurants, but also the contrast between our sincere eagerness to learn as much about China as we could from our stay in Beijing, but the intuitive urge to emulate European student life in the alien environment. We had a number of restaurants close to our campus, but we regularly tried out the fancier eateries in town. The book is full of anecdotes about our culinary adventures. We had a silent agreement that we would reserve the top places, including the Fengzeyuan, for special occasions, like birthdays. We were also an international bunch. This birthday dinner only included my most intimate friends, but further in the book you will meet a few English and the occasional Australian and Canadian. This entry was posted in Uncategorized and tagged Beijing, Fengzeyuan Restaurant, Moutai by eurasiaconsult. Bookmark the permalink.